If the referendum fails, then it is not mandatory and the results are meaningless. Back to the Russians. Over the past 30 days, more than a dozen of Putin’s emisars were dispatched to Macedonia to lobby for a name change. Emissars along the likes of Mad Dog Mattis. Typical of Putin, he sent a Russian Mad Dog to Macedonia and then dispatched another mad dog in Theresa May, where she lobbied for Macedonia to change its name so it could allegedly enter an organization in 7-10 years, while May’s own country is leaving the same organization. There is a running joke now in Macedonia with the populace asking whether the globalist war criminals plan on sending Brad Pitt and Monica Bellucci next to lobby for the name change!? They’ve sent everyone else. 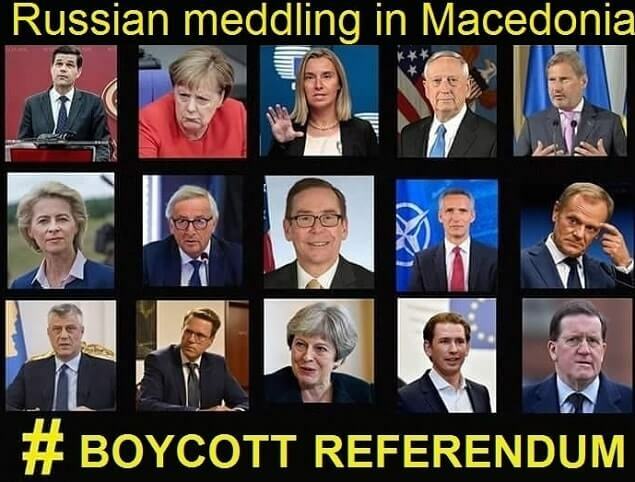 Even Putin’s personal assistant Angela Merkel and part time waffle house waitress Federica Mogherini were sent to Macedonia, again, something the Russians would absolutely do. Needless to say, the list of Russian meddling in Macedonia is very extensive, and below is just a sample of it. Lets all stop the above mentioned Russians and boycott the referendum.